Checkpoint inhibition, a revolutionary cancer immunotherapy, works only in a minority of patients, and scientists want to know why it is resisted in the majority. At the UC San Francisco (UCSF), scientists think they have found an answer—one that runs counter to current cancer immunotherapy dogma. These scientists say that immune cells don’t have to reach the tumor niche to encounter immune-suppressing protein, as dogma has it. Instead, immune cells may run afoul of immune-suppressing proteins carried by roving exosomes. Exosomes that sprout from cancer cells may travel through the lymphatic system or bloodstream to lymph nodes, the sites where immune cells are activated. 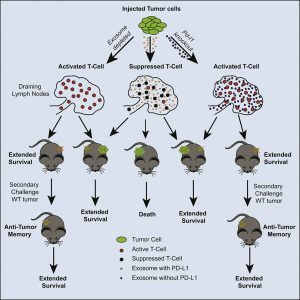 There, the exosomes, which are packed with the immune activity–suppressing protein PD-L1, effectively disarm immune cells and prevent them from locating and attacking tumors. Details of this remote-deactivation mechanism appeared April 4 in the journal Cell, in an article entitled, “Suppression of Exosomal PD-L1 Induces Systemic Anti-tumor Immunity and Memory.” The article describes how exosomal PD-L1 acts systemically to suppress the antitumor response. The article also provides evidence that genetically blocking the remote-deactivation mechanism can promote T-cell activity in the draining lymph node, inducing systemic antitumor immunity and memory. “Removal of exosomal PD-L1 inhibits tumor growth, even in models resistant to anti-PD-L1 antibodies,” the article’s authors wrote. “Exosomal PD-L1 from the tumor suppresses T cell activation in the draining lymph node. Systemically introduced exosomal PD-L1 rescues growth of tumors unable to secrete their own. The UCSF scientists, led by Robert Blelloch, MD, PhD, decided to explore exosomes when they noticed something strange that suggested the standard model of PD-L1 presentation was flawed. Like scientists that came before, they found low levels of PD-L1 protein in resistant cancers. But when they looked at messenger RNA (mRNA), the molecular precursor of all proteins, they observed an odd discrepancy: there was far too much PD-L1 mRNA for the scant amount of PD-L1 protein that they measured in the cells. In malignant tissue, a protein called PD-L1 functions as an “invisibility cloak”: by displaying PD-L1 on their surfaces, cancer cells protect themselves from attacks by the immune system. Some of the most successful immunotherapies work by interfering with PD-L1 or with its receptor, PD-1, which resides on immune cells. When the interaction between PD-L1 and PD-1 is blocked, tumors lose their ability to hide from the immune system and become vulnerable to anti-cancer immune attacks. One reason that some tumors may be resistant to these treatments is that they do not produce PD-L1, meaning that there is nowhere for existing checkpoint inhibitors to act—that is, they may avoid the immune system using other checkpoint proteins yet to be discovered. Scientists have previously shown the PD-L1 protein to be present at low levels, or completely absent, in tumor cells of prostate cancer patients, potentially explaining their resistance to the therapy. To show that exosomal PD-L1 was responsible for imparting immune invisibility, the researchers turned to a mouse prostate cancer model that’s resistant to checkpoint inhibitors. When they transplanted these cancer cells into healthy mice, tumors rapidly sprouted. But when the scientists used the gene-editing tool CRISPR to delete two genes required for exosome production, the edited cancer cells were unable to form tumors in genetically identical mice. Though both edited and unedited cells were producing PD-L1, only those unable to create exosomes were visible and vulnerable to the immune system when PD-L1 was blocked. In a complementary experiment, the same CRISPR-edited cancer cells were transplanted into healthy mice, immediately followed by a series of injections of exosomes carrying PD-L1. Unable to produce exosomes, the CRISPR-edited cancer cells should have fallen victim to the immune system. Instead, the injected exosomes were able to neutralize the immune response on behalf of the cancer, which allowed the exosome-deficient cancer cells to form tumors. To figure out how exosomal PD-L1 was interfering with the immune system, the researchers inspected the lymph nodes of mice that received either CRISPR-edited or unadulterated cancer cells. Mice that received the edited cells showed increased immune cell proliferation and had higher numbers of activated immune cells in their lymph nodes, the central command hubs of the immune system. In a separate mouse model—a colorectal cancer that’s only partially responsive to immunotherapy—the researchers identified two distinct pools of PD-L1: one on the surface of tumor cells that’s sensitive to PD-L1 inhibitors, and another in exosomes that’s resistant. When they treated the cancer with a combination therapy that involved both preventing exosome formation and administering PD-L1 inhibitors, the mice survived longer than those treated with either approach alone. “These data from two very different cancer models suggest a novel therapeutic approach, where suppressing the release of PD-L1 in exosomes, either alone or in combination with current checkpoint inhibitors, could overcome resistance in a large fraction of patients currently resistant to treatment with checkpoint inhibitors alone,” Blelloch said. In a surprising result from the new paper, the researchers found that they could use CRISPR-edited, exosome-deficient cancer cells to induce an anti-cancer immune response that targeted tumors that normally resist immune attack. The researchers first transplanted CRISPR-edited cancer cells unable to produce exosomes into normal mice and waited 90 days. They then transplanted unedited—and presumably immune-evading—cancer cells into the same mice. After having exposed the immune system to the CRISPR-edited, exosome-deficient cancer cells, the unedited cells were no longer invisible. 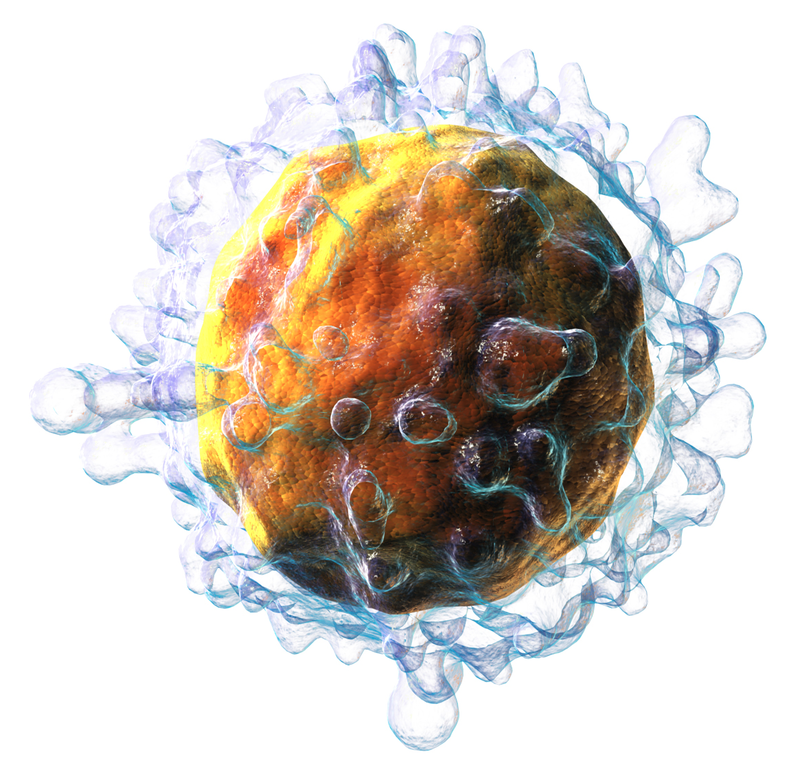 Instead of ignoring these cells, the immune system mounted a vigorous response that targeted these formerly immune-evading cancer cells and prevented them from proliferating. “The immune system develops an anti-tumor memory after being exposed to cancer cells that can’t produce exosomal PD-L1. Once the immune system has developed memory, it is no longer sensitive to this form of PD-L1 and thus targets exosomal PD-L1-producing cancer cells as well,” Blelloch said. Another surprising result was achieved when both unedited and CRISPR-edited, exosome-deficient cancer cells were simultaneously transplanted into opposite sides of the same mouse. Though they were introduced at the same time, the CRISPR-edited cells proved dominant — they were able to activate the immune system, which then launched an attack that destroyed the unedited, supposedly immune-resistant tumors growing on the other side. These results suggest that even the temporary inhibition of the release of PD-L1 in exosomes could lead to long-term, body-wide suppression of tumor growth. Furthermore, they hint at the possibility of a new kind of immunotherapy, one in which a patient’s cancer cells can be edited and reintroduced in order to activate the immune system and goad it into attacking immune-resistant cancers. Suppressing the release of PD-L1 in exosomes or the introduction of the “tumor cell vaccine” devised by the Blelloch team may one day offer hope to patients whose tumors don’t respond to today’s treatment options.